Easily decorate your party using one of my DIY Pennant Banner templates! Each pennant banner is now available for purchase individually! 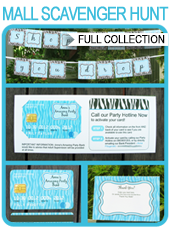 Printable pennant banners are an easy and inexpensive way to dress up your party. Simply choose your birthday party theme, then either print the Happy Birthday banner immediately OR customize your banner by personalizing the letters on each pennant to print out your own custom penannt banner. After printing trim/cut out each pennant and assemble with ribbon. To customize your own banner message, use the Editable Banner pennant panels & personalize the letters easily yourself at home using Adobe Reader. Just open the file, highlight my sample letter and type in your own. Fonts are already embedded in the file too. 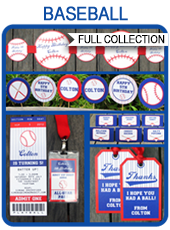 Create a “Happy Birthday [Name]” pennant banner or “Concessions” banner for your Baseball food table etc. You are limited only by your imagination! Each theme also comes with a non-editable file that already has “Happy Birthday!” already spelt out on the pennants for you. This is perfect for when you are in a rush – it’s easy no-fuss printing. Each banner is super easy to assemble. Cut out each pennant with scissors or a paper trimmer, then punch holes in both top corners using a hole punch. Thread a coordinating ribbon through each pennant, leaving enough ribbon at the ends to tie the banner up. See all my editable DIY Pennant Banner templates here now!